Over the last 8 weeks, in addition to training at The Dojo, Steph and I have been training together at home following the GSP Rushifit training program. We both needed to lose weight and wanted to have a program we could follow together and this seemed to be a good one. I mentioned breifly about starting this a while back and now that we’ve finished the first 8 week run through of it I thought an update was in order. The program is good, its a functional fitness workout with a good variety that you can easily do in your living room with minimal equipment. I used a pair of 10kg dumbells and that was all I needed. Ive had some dietary modifications that I recently blogged about also, but that was really only in the last 3 weeks of the program. In terms of weight loss, Ive lost 5kg/ 11lb. 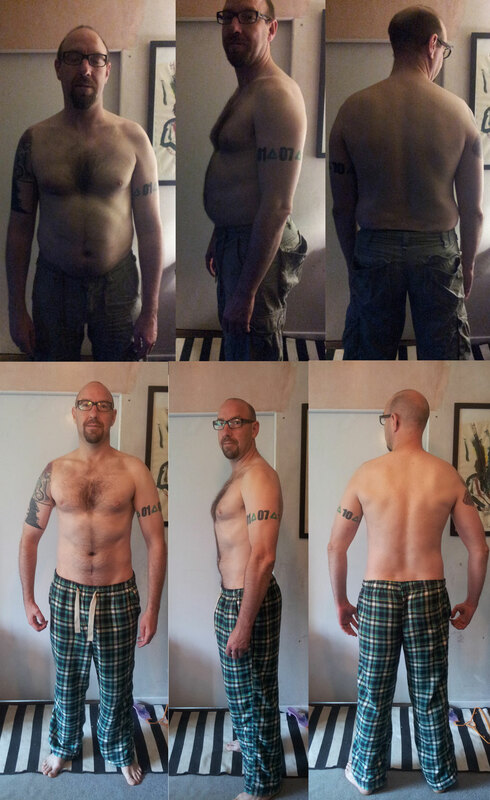 Thats pretty decent in 8 weeks, but again, most of the weight loss occured in the last few weeks. The first few weeks I cut fat and put on muscle. Which was obviously a quite useful thing to do. Im not going to write much more here, the before and after photos basically say it all. I should add though that in the before photos, despite being a bit of a fatty, I was pretty fit. I had run a marathon at this weight and was training fairly regularly. However it just shows that you can be fairly fit but still overweight and unhealthy. So, without further ado, here we go.. the before and after photos and I apologise in advance for my toplessness and for any distress the photos (particuarly the before photos) may cause. Who ate all the pies? Oh yeah.. me. That’s from just 8 weeks? !